An oldie but a goodie. 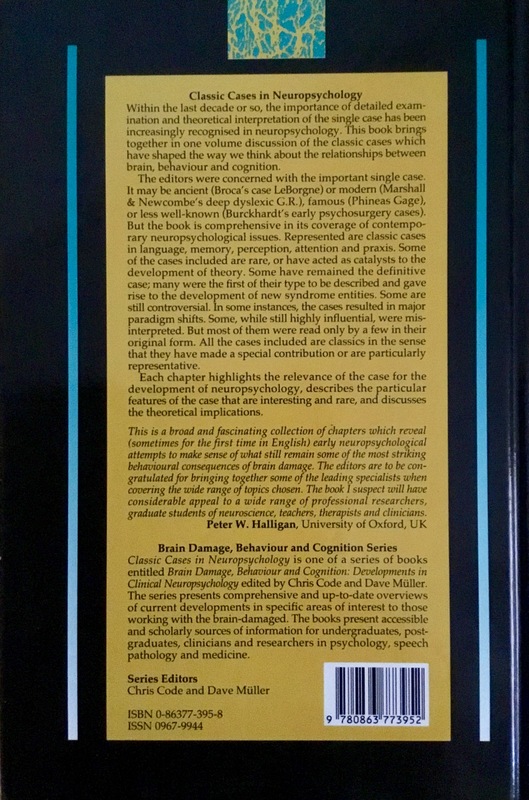 The fact that Code focuses on classic cases means this hasn’t aged as badly as other works on neuropsychology from 1996. I recommend it as an introduction to the field, or a dip into the history & development of neuropsychology from its roots in neurology. From Phineas Gage to H.M., these cases are like twists in the detective story that has been modern neuroscience. Each of these people, by offering themselves to science for study, has deepened our understanding of the brain. Modern neuroscientists might criticise the “lesion” based approach, and in isolation it is misleading. However the modular model of the brain they gave us served as a useful jumping-off-point for the parallel processing, default-mode-network obsessed mess we currently have. Probably only available in hardcopy secondhand, it is still available, and has recently become available as an ebook.